Faculty of Business Administration (FBA) has maintained its accreditation by AACSB International, The Association to Advance Collegiate Schools of Business. Founded in 1916, AACSB International is the longest serving global accrediting body for business schools that offer undergraduate, master's, and doctoral degrees in business. Only 607 schools of business, or less than 5 percent worldwide, have earned this distinguished hallmark of excellence in management education. To maintain accreditation, a business program must undergo a rigorous internal review every five years, at which time the program must demonstrate its continued commitment to the 21 quality standards relating to faculty qualification, strategic management of resources, interactions of faculty and students, as well as a commitment to continuous improvement and achievement of learning goals in degree programs. 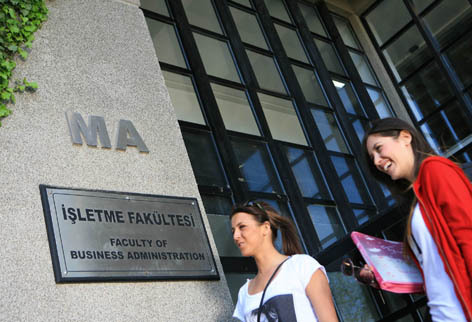 Bilkent FBA received its initial accreditation in 2006 and became the first accredited business school not only in Turkey, but also in the region. In March 2011, the visiting accreditation team reviewed the five programs of FBA and recommended maintenance of accreditation for the next five years without any reservations. The team commended the following strengths, unique features and effective practices of FBA: Commitment to academic excellence, achievement of national leadership in business education programs, achievement of success in recruiting and retaining faculty trained and employed at internationally respected universities, faculty evaluation process, mentoring of faculty, and the assurance of learning process providing improvement to existing curriculum. In his e-mail message to the current students and alumni, Dean Erdal Erel has stated that the faculty, students, and alumni are enjoying the pride and joy of being affiliated with a business school crowned with this prestigious mark of quality distinction.